Researchers have long recognized that conservatives are happier than liberals. For instance, in a Pew study from 2006, 45% of Republicans reported that they were very happy, in contrast to only 30% of Democrats. In the same survey, the most frequent churchgoers seemed to be the most contented, whereas those who rarely or never attended church were the least happy. Similarly, married couples were far more satisfied on average than those who were not married. There is, however, less agreement on the causes of this political happiness gap. One study postulated that conservatives are more content because they have a higher tolerance for inequality than liberals. To the untrained bystander, it sounds like a polite way of suggesting that liberals are more envious than their conservative counterparts. Another study links the conservative happiness to traditional values like marriage. They also tend to believe more in free will and personal agency, which may give a feeling of accomplishment that promotes happiness. Conservatives also have far more children than liberals. Without the 1965 Immigration act, which changed how quotas were allocated and installed a new policy aimed at reuniting families and attracting skilled labor, most states in America would probably have been deep red. However, the dwindling number of locally produced progressives has been more than compensated by importing left-leaning voters from third world countries. But happiness can be dangerous for the future if it makes people too complacent – fat’n’ happy, as the saying goes. Biologically, happiness is a form of satiation. It reduces the desire to pursue change or remain vigilant. Why change a winning formula? Unhappiness, by contrast, is a bodily signal that something is wrong in your life and a physiological call to action. It can be a strong motivator. Obama’s “Hope” and “Change” slogans didn’t appeal to the merry, but to the discontent. History is full of warnings of complacency. In Egyptian mythology, the envious god Set conspired against and killed his brother, Osiris. Osiris was complacent and did not discover the treachery until it was too late. Horus, the son of Osiris, battled and defeated Set and went down into the underworld to rescue his dead father and gave him his eye so that he would never again be blind to the dangers growing in their midst. Mythology often has the profound ability to ring true throughout the ages. It’s a warning well worth heeding. Conservatives are so busy being happy that they may not have noticed that the envious, unhappy left has conspired behind their backs and taken over the commanding heights of society. They control the media, Hollywood, academia, and even middle management of private companies like Google, Facebook, and Twitter. And worse: they are importing socialists from developing countries at such breathtaking speed that unless stopped very soon, a liberty-oriented president or party will have a good deal of trouble ever winning an election again. Thus liberty lovers must stay vigilant. 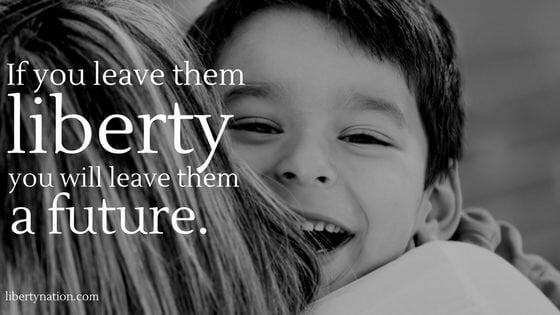 If they don’t, they and their children might soon find their happiness eroding and their dream turned into a nightmare.